Parents, be warned: The children’s horror movie franchise Shrek may be headed back to the big screen. 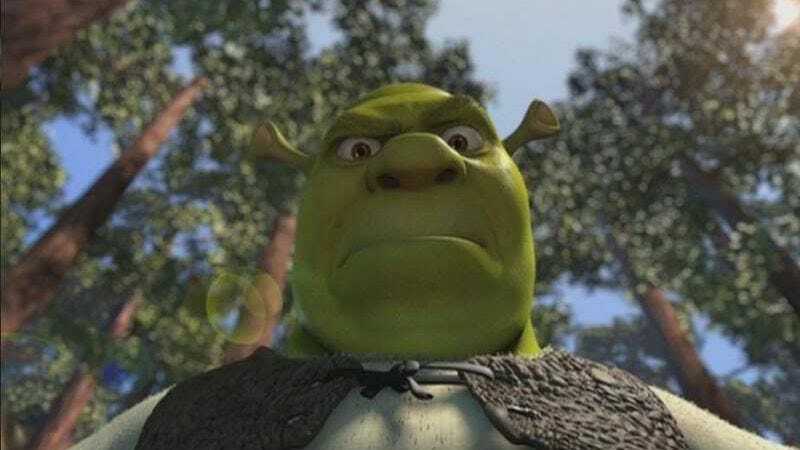 The series—which features the swamp-dwelling, human-scaring ogre of the title, his equally bestial wife, and their demonic offspring, along with a nonlinear donkey and a conniving cat in footwear—has terrified small children since the 2001 movie Shrek, followed by 2004’s Shrek 2, 2007’s truly horrifying Shrek The Third, and 2010’s ominously titled Shrek Forever After. Somehow this series is the most popular franchise title of DreamWorks Animation (besting the Madagascar and Kung Fu Panda movies), and DWA is not about to let audiences escape unscathed. CEO Jeffrey Katzenberg remarked to Fox Business Network, “I think you can be confident that we’ll have another chapter in the Shrek series. We're not finished, and more importantly, neither is he,” a threat striking fear into the hearts of young families everywhere. Even though later versions of the ogre-themed films—featuring a twisted, macabre fairy tale world with gruesome talking pigs, wayward wooden boys, and a giant gingerbread man—have grossed less than the earlier ones, they still do impressive business overseas, meaning that DreamWorks will no doubt continue to pummel audiences with Shrek movies for the foreseeable future. The first Shrek film was the winner of the inaugural Best Animated Feature Film Oscar at the 2001 Academy Awards.